I was recently reading a research paper (Gottschall, T. et. al., Nature Materials 2018) titled “A multicaloric cooling cycle that exploits thermal hysteresis.” The article reports on a novel method in the development of refrigeration technology. Artificial refrigeration began in the mid-1750s, and developed in the early 1800s. In 1834, the first working vapor-compression refrigeration system was built. Since then, commercial and public refrigeration systems have been based upon the vapor-compression cycles which are notorious for high power consumption due to the amount of electricity needed to run the compressor. 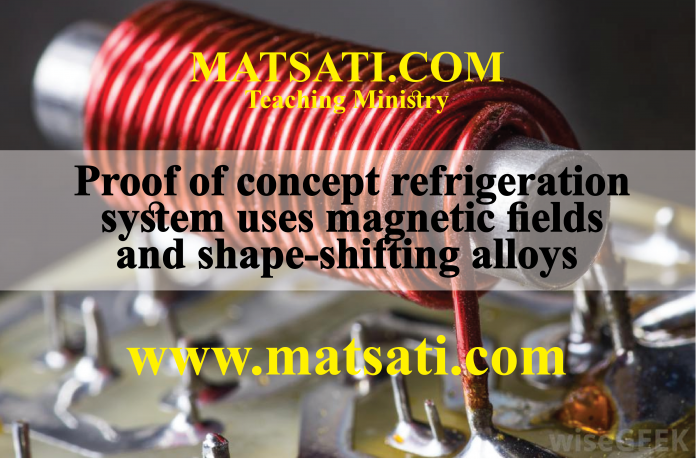 The novel approach and proof of concept research that is taking place today is to make a lower power cooling system that uses magnetic fields and shape-shifting memory alloys to replace the vapor-compression cycles in conventional refrigerators. The article reports a magnetic cooling system that exploits the magneto-caloric effect of materials which change temperature when exposed to a magnetic filed. This technology however is plagued by the complexity of the devices and energy efficiency issues. The inefficiencies are related to the use of superconducting magnets being used which require their own cooling system. To get around the use of superconducting magnets, researchers are studying rare-earth metal magnets and Ni–Mn–In Heusler alloys. The rare-earth metals are used to create permanent magnets capable of generating very strong magnetic fields (~40,000 times stronger than that of the Earth). The alloy uses a mixture of nickel, manganese, and indium to create a shape-shifting memory alloy (google search). The alloy will cool down when exposed to the magnetic filed and is a memory metal which can return to its original shape after being deformed. Using these materials, the researchers developed a six-step refrigeration cycle. The project was a feasibility study to demonstrate how memory metals and permanent magnets can reduce the amount of energy required for refrigeration systems. This research was published in the Journal of Nature Materials. So how do these things relate to our faith? While reading this research paper, I was reminded how God’s purpose in creation and redemption is to have a family of children conformed to the image of his Son. But how does that happen in us? Paul wrote that being transformed into the image of the Son of God is a process, and it takes time and is a constant struggle. This sounds a lot like the life of a researcher. A researcher searches out a matter, seeks to understand the nature of the materials he is working with in the application to solve a particular problem, just as in the case of the refrigeration system. In our case, the Lord God is the researcher who knows everything about us, He is working in us, molding, shaping, and conforming us unto the likeness of His Son. A parallel is found in the use and combination of various materials (i.e. the rare earth metals) to create something better, more powerful, and useful for its application. To me this is what the Lord God is doing in our lives, making and molding us, working to change us into something useful. Paul wrote, “And we all, with unveiled face, beholding the glory of the Lord, are being transformed into the same image from one degree of glory to another. For this comes from the Lord who is the Spirit.” (2 Corinthians 3:18). What we learn from Paul’s letter is that our lives are an ongoing process in which the Lord is helping us, guiding us, and empowering us to resist sin in our lives. This process takes a lifetime as the Lord God molds us and transforms us in holiness and righteousness. Brown Driver and Briggs Lexicon states,the word צֶ֫לֶם is a masculine noun meaning “image” (something cut out, likeness, of resemblance, ׳בְּצ (בָּרָא) עָשָׂה, of God’s making man in His own image, Bereshit / Genesis 1:27). Figuratively speaking means a “semblance” of something. When God created man, He made us in His image. This was His plan that we would reflect the image of God in many ways, seeking to do what is good (maasim tovim) and to seek the Lord God and His will when we are in need of help. When we seek justice and truth, and live our lives for the Lord in love, righteousness, holiness, and peace, we are reflecting His image and bearing His testimonies. When we study the Apostolic Writings (NT) we are told that we are to be like God’s Messiah where the text states that He “loved righteousness and hated wickedness.” (Hebrews 1:9). Yeshua did not just act righteously, He loved righteousness. He loved equity, fairness, justice, and upright dealings with others while at the same time He hated wickedness. Is your relationship with God functioning in the same way? John 6:38 states, “To be like Yeshua is not just to stop committing a few obvious sins such as lying, cheating, gossiping, and thinking impure thoughts.” To be like Yeshua is to seek to do the will of the Father. What is the will of the Father? The Lord God Almighty is working in our hearts to come to the place where we delight to do the will of God, no matter how sacrificial or unpleasant that might be. What we learn here is God’ revealing Himself to Moshe and in doing so, the Lord reveals the greatness of His compassion, His mercy, His slowness to anger, and His lovingkindness (Grace) and forgiveness. This reveals to us that salvation is a gift from God due to His mercy. As we study these things, on the way in which the Lord is working in our lives, if your life does not show evidence of God working in you, it is highly likely you have never received this gift of God. The distinction here is the difference between the one who simply goes through the motions, as opposed to the one who sincerely desires to live and do the will of God. If you do not have a sincere desire to serve God, maybe there is a greater problem? Pray to our Father in heaven, in the NAme of Yeshua the Messiah for help, to be truly transformed into the likeness of His son. This is vitally important, because if the Lord is not working in your life, that means you are not a part of His project. As a child of God, we are tasked to search out these things in our lives, to understand the nature of God and to seek His working in our lives not just to solve our problems, but for the greater application to serve Him and to be a part of His Kingdom.